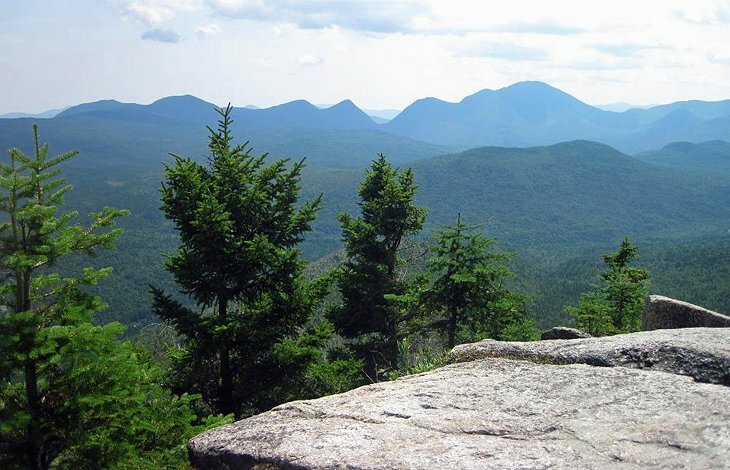 Under a canopy of mixed hardwoods along the banks of the Zealand River, deep in the White Mountain National Forest, Sugarloaf I and Sugarloaf II are twin campgrounds managed by the US Forest Service. Most campsites are large and they are well separated, most with well-designed fire rings for campfire cooking. Sugarloaf II has a hand pump for water, so most campers here simply carry water from Sugarloaf I, which has spigots. Both are popular with hikers, who don’t mind the remote feeling of the well-spaced sites, nor the absence of showers. The trail up Sugarloaf Mountain – a ledge-covered summit with 360-degree views – leaves from a few yards away, and at the end of the access road is the trailhead for the 2.8-mile family-friendly hike along the river to Zealand Falls Hut. The AMC hut is a staffed overnight hut on the Appalachian Trail, with views into Zealand Notch. Just a few miles away is Mt. Washington, with its trails and famous Cog Railway.